You are currently browsing the tag archive for the ‘1960’ tag. ‘Where is Mama’* is a charming little film in which we watch a school tadpoles seeking their mother. They mistake two shrimps, a goldfish, a crab, a turtle and a catfish for their mother, before their real mother finds them. Told by a voice-over, ‘Where is Mama’ is a genuinely Chinese film: it is based on an ancient Chinese fable, it is typically preoccupied with nature and water, its watercolor and ink style is based on classic Chinese painters (most obviously Qi Baishi), and it is set to a serene and leisurely speed. The result is a film that is a bit slow, but poetic in feel and strikingly beautiful. The short looks timelessly Chinese, but at the time of its release the film’s style was completely new and daring within the Chinese animation film world. However, it would take ca. twenty years before its influence became clear, because five years after the making of this cartoon the Shanghai Animation Studio was shut down as part of the Cultural Revolution, and many of its employees were sent to re-education camps in the countryside. Only in the late seventies it would be up and running again. In the following decade ‘Where is Mama’ would be an inspiration to many Chinese animators, who would reuse several of this film’s key elements. 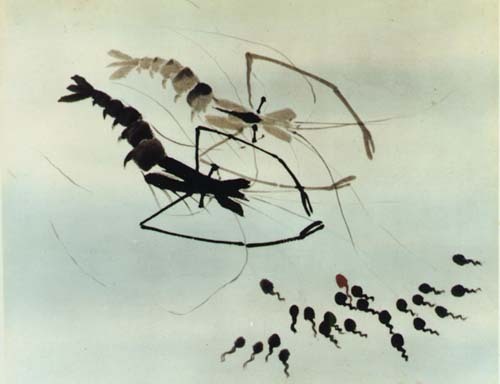 In that decade, too, Te Wei made his own masterpiece, ‘Feeling from Mountain and Water‘ (1988).